SKIING in Courchevel, France earlier this year (more of that in a later issue) I realised something was different. My skiing had magically improved and all I'd done was sit on the couch all winter. The man responsible for this miracle was Adalbert Leibetseder, the magician of ski boots. During the Southern Hemisphere ski season you’ll find Adalbert installed at the luxurious Astra Lodge, Falls Creek, Australia. In the Northern Hemisphere ski season he lives in Bundessportheim, St Christoph/ Arlberg, Austria. Named Australia’s Best Ski Boutique Hotel, for the second time, at the 2017 World Ski Awards in Austria, Astra Lodge casts its own spell. In three years of staggered renovations, owners Seumas Dawes and Rosy Seaton have created a magical mountain retreat. It has a European alpine feel complete with roaring fire, leather, timber, stone and stylish soft furnishings. A discreet stag motif canters across cushions and hide rugs are scattered on the floor. Next to the new state-of-the art ski and boot room is the workshop of Adalbert Leibetseder, a legend in the industry. His Skimetric academy and bespoke equipment are staggeringly successful. 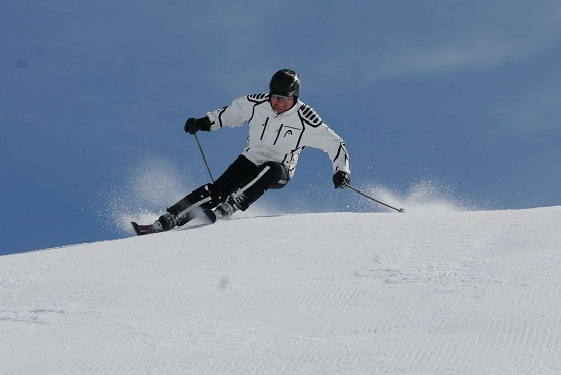 His client list includes the world’s fastest ski racers (who between them have almost 60 world and Olympic medals). The theory behind Adalbert’s work is that no matter how good a skier you are, if your equipment doesn’t work in harmony with your physiology then your skiing will suffer. Adalbert’s alchemy is created by a unique combination of circumstances: a father who was a shoemaker, a lifetime spent on skis, and experience developing high-end ski equipment. Add to this advice from a panel of medical experts and a perfectionist’s eye for detail and you have the formula that helps Adalbert turn leaden skiers into gold. To transform my boots Bert takes measurements to build a 3D picture of my foot. The machines are so intricate and the series of tests and measurements so precise that I feel I’m about to be sent on a mission to Mars instead of down a blue run. Nobody has ever cared as much about my turned-in knee or the position of my big toe. As it happens, the end result is indeed out of this world. First I go out skiing with Bert so he can video my turns. As you’d expect from a former instructor and champion ski racer Adalbert is poetry in motion on skis. As for me? Well, suffice it to say I’m not. Bert doesn’t judge; he merely records. He’s going to change it all anyway. After a few adjustments back at Astra Lodge I’m ready to try on my made-over boots. Already the results are astounding; my knock knees are gone, my legs perfectly aligned; even just standing in the workshop I look like more of a skier. Bert is such a perfectionist that he even designs the socks to go with the boots, lest a wrinkle in the wrong place or cold toes interfere with performance – and they are in fact the best socks I’ve ever worn. Relaxing in the hotel’s heated magnesium mineral pool later that evening I reflect on the fact that Bert and the hotel owners have a lot in common: they too have thought of everything. From the snowdrift-soft pillows on my bed to the organic bath amenities, everything is top quality. Financier Dawes is used to the best and clearly thinks his guests deserve it too. The Italian restaurant is the best in Falls Creek and the newly opened premium wine cellar is stocked with some of Dawes’ own favourite ‘ski wines’ from Italy and the subalpine Tyrol, not to mention a bottle or two of Grange Hermitage. There’s also a library where you can curl up with a good book and a mountain view, as well as a spa with massage rooms, wet and dry saunas, nail bar and hairdressing service. The next morning after a hearty breakfast, I am ready to test myself on snow. Retraining muscle memory isn’t easy; at first I feel like I’m back in ski kindy. However, with Bert’s gentle encouragement it doesn’t take long for me to realise what this makeover has done for me. With my new balance there is precision to my turns and everything begins to flow. Not quite poetry in motion, but there’s rhythm. A version of this article appeared in volume 26 of Signature Luxury Travel & Style, Australia’s highest circulation luxury travel magazine.